How many storylines should a pilot have? Usually, they have fewer storylines than an average episode. Because we have to get to know all of the characters and the world of the show, there’s less time for plot. But another way that the “CSI” pilot is remarkable is that the creators go the other direction: there are five cases in this episode. But they know that we’ll demand closure to at least some of the cases, meaning that they have to create two cases that unrealistically get reported and closed all within that one night’s span, including instantaneous test results that actually would have taken weeks. So what does all of this do to the “dramatic question”? 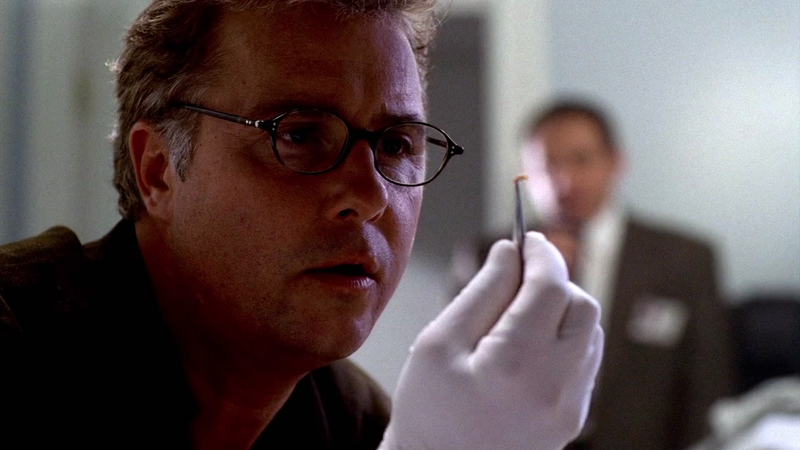 The opening teaser of the show begins with Grissom showing up on the scene of a supposed suicide and determining that it was murder, and of course we keep cutting back to the progress of his investigation over the night…but in the end, the crime remains unsolved and temporarily abandoned. Normally, it’s very unsatisfying in any story if the original dramatic question is simply abandoned, but this is another remarkable achievement of this show: they get us to admire the team’s successes and failures, and they discourage us from differentiating between the two. This is part of the show’s celebration of the scientific method: the purity of the process is more valuable than the attainment of a desired result. The fact that, by the end of the pilot, we’ve already learned to admire Grissom despite his lack of results is a testament to how successful they have been in quickly rewriting our expectations. One thing that is really impressive about The West Wing pilot is how quickly and succinctly they introduce all the characters so they can get on with the plot of the episode. I agree. The next show we'll look at also does a great job of lightning fast ensemble-introduction. This is to let you know your article made me, a long time CSI fan, look at the series with fresh angles and renewed interest. CSI is one fine example what makes a show works: clever scriptwriting, intriguing characters and good cast ensembles. The original CSI's TPTB should be saluted for possessing clear vision on what to do with this show. They allowed the storylines to evolve and characters to grow but they never lost their sight on the show's direction and we, the viewers, learned and grew up, if not grew old, with all those characters. The show won't fly if the viewers don't care about its characters. Hope you don't mind this out of place request: Could you, if possible, please do an in-depth analysis of CSI's characters? It'd be great to see your take on them and see how they fit in the grand scheme of things you have laid out here.